A Week of Stuff, just Stuff. Aww, You Red Devil, You! Manchester United caught Shinji Kagawa by surprise when they suddenly announced on their site that they had pretty much reached an agreement with Kagawa. Of course, the reaction in the media both in England/Japan and around the world was immediate. Kagawa himself kept tight-lipped about the final steps to making it official by saying that because the deal was not yet fully complete, he was not comfortable making any comment on the situation. He stressed the need to focus on the week ahead and the remaining World Cup Qualifiers against Jordan and Australia. Many fans were relieved to see he was handling the situation so maturely, though it didn't stop the rest of us from going a little nuts for a while. Zaccheroni himself, commenting that he was also asked to refrain from making any lengthy statement about the big transfer, admitted that it was impossible not to say anything. He revealed that he told Kagawa "Good luck" but not "Congratulations" -- in other words, this was not the finish line but merely the starting point. Pretty apt. After tying Iraq at home 1-1, Jordan landed in Japan on the evening of the 5th. Jordan have always struck me as a tough team who plays with a lot of heart. Throughout the week the Japanese media never forgot to mention that Japan had yet to actually win against Jordan inside 90 minutes, and a lot of discussion revolved around why Jordan had always given us so much trouble. Their most well-known player among Japan supporters is their goalkeeper Shafi -- burned into our memories during Asia Cup 2004 when S. Nakamura and Alex both missed their shot during the penalties. Shafi didn't actually stop the shots -- the balding patch of dirt to the right of the PK spot was the culprit. However, we do remember the huge knot of dread in our stomachs as we watched Shafi's little celebration poses. Through what kind of esoteric calculations, I have no idea, Japan's FIFA Ranking bounced back up to 23 this week from the previous 30. Australia came in second in Asia with 24, and Korea is at 35. 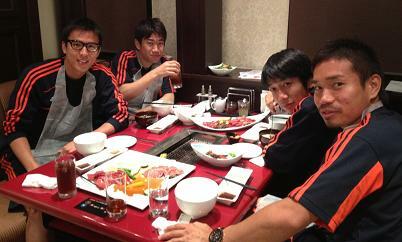 The day after the Oman game, Zaccheroni and the JFA treated the squad to a night out at a Korean Barbecue restaurant. Kengo Nakamura and Hasebe both shared this photo on their blogs -- nothing says "cool" like paper bibs at the dinner table! 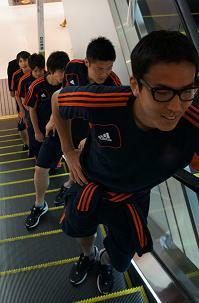 Maya also posted this photo of the guys posing on an escalator during one of their walks around the hotel neighborhood. Click photos to enlarge. The surprisingly in-tune voices of the record-breaking crowd at Saitama Stadium gave a beautiful performance of the Japanese national anthem. I have to admit, I prefer the instrumental-only version of the anthem so that you can hear the voices of the stadium. During friendly games, the sponsors always arrange to have some soloist sing it a capella, but nothing beats this giant chorus of 63,500+ voices. There was definitely a power to the crowd this night even prior to game start. It set a strong tone for the evening. Japan took off from the whistle and continued to barrage Oman's defenders with lots of build-up via the sidebacks. I was glad to see Uchida putting in a much more spirited and ambitious performance particularly in the first 20 minutes. There was a lot of concern about whether the Europe-based players were going to be fit for the game, and although Hasebe admitted they were not at 100% yet it was obvious that the players were not planning on cutting any corners. There was a distinct thoroughness to the way they played both in defense and offense, as if they were keeping mental images of training maneuvers in their minds. One aspect of training did bear fruit with a series of forward-moving one-touches allowing a speedy Nagatomo up the left side for a lobbed cross to an unmarked Honda at the far post for goal (11 min). The volley was angled and cleverly timed. Things curiously slowed down after the first goal. Though Japan should have and could have tripled their lead in the first half, they seemed to fall into a semi-waiting game against Oman. I can only assume that the players were expecting Oman to switch their engines on to a more attack-minded play. But Oman stayed mysteriously quiet, showing no hint of wanting to score. Whether this was part of Oman coach Le Guen's gameplan, or whether it was just a result of Oman's nerves getting the best of them, I can't be sure. A good talking-to during half-time seemed to do the trick, as the Samurai Blue returned to the pitch with more gusto. 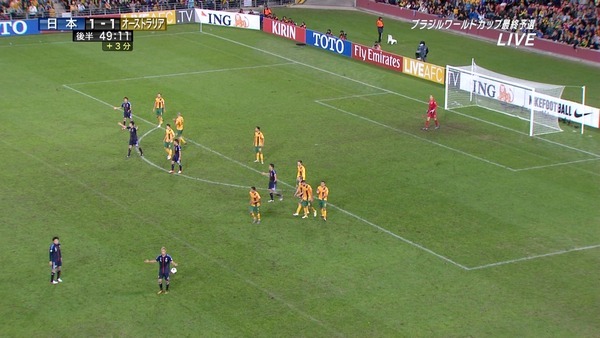 It took a beautiful diagonal through pass from Kagawa to Maeda to finally double the score at 6 min. This certainly looked off-sides, but given the wonky linesmanning (is that a word?) during the first half, I figure we fared even. The goal count went to three only a few minutes later when dribbling efforts by Nagatomo, Kagawa, and Maeda were rewarded by an Okazaki goal. In true Okazaki fashion his goal was less an elegant "set up" than it was a "collision" of opportunity, but that is his trademark, and it certainly has kept his international goal-count up. Having collected a yellow card, Uchida was taken off and substituted by 22 year old Hiroki Sakai. Sakai was 2011 J-league Best New Player, and is expected to sign with a Bundesliga club in the near future. Okazaki, who had gunned his engine for the entire game, was substituted by Hiroshi Kiyotake (signed with FC Nurnberg starting July 1). You may remember him as the 22 year old who set up Honda's goal in the 3-0 friendly against Korea last year, or who sent up the cross for Yoshida's dramatic last-minute header during last qualifying round's home game 1-0 against North Korea. H.Sakai looked understandably nervous at first, but he soon created a number of good chances from the right, taking advantage of his speed and power. One particularly promising play allowed him up to the base line for a cross back to Honda. Al Habsi showed his ability by denying Honda's shot as well as responding quickly to the follow-up shot by Kiyotake. Both Sakai and Kiyotake did not play to the best of their full abilities, but they were decent. Endo was then subbed out for a spirited Hosogai whose energy always refocuses the team's defensive discipline when things start to wane towards the end of games. 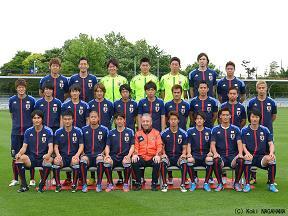 Here is a neatly edited compilation of Japan's big chances. According to match statistics Oman had only one shot during the game. Le Guen's post-game comments: “Japan deserved to be the winners as they were far better than us. To be frank we did not really exist in this match,’’ said Oman’s coach Paul le Guen in his post-match comments. “Our boys did not create any scoring opportunities and I am disappointed with that...We have to improve in order to come to such a level. Losing to Japan in Japan is not a shame. We will try to play better against Australia in Muscat on June 8,’’ said Le Guen. It's been an intense week with the Samurai Blue as they continued preparations for the start of the Final Qualifying Round game. The first half of the week was dedicated to physical conditioning of the players. Zaccheroni insisted on gathering the European players early to camp in order to get their bodies back on track during this post-season period. J-league players had games last Saturday and joined the squad training on Day 4, while Gamba Osaka players staggered in a couple days later after the Asian Champions League group game. The latter half of the week was primarily focused on strategy -- particularly Oman-specific tactics. Though Zaccheroni allowed for the first 15 minutes of training to be open to media, cameras and reporters were shut out of the remainder. Oman arrived in Japan under the poker-faced management of French coach Paul Le Guen. As you may know, he was the coach in charge of Cameroon during the 2010 World Cup, where Japan played Cameroon in the first match of the group games and had a surprise victory over the African giants 1-0. Japanese media aired segments on the Oman team leading up to the game, focusing on profiling national hero and Premier League Wigan goalkeeper Ali Al Habsi. The long week together being confined within the walls of the hotel does have its down-side as the players begin to get antsy. Certain members of the squad have made it a habit to take strolls around their hotel/facilities whether in Japan or abroad. This video, taken by Kawaguchi on his mobile during their walk (May 31), shows Yoshida goofing with the child-sized slide, Maeda, and Miyaichi. After being confined for a week, Hasebe decided to join them for the first time -- he shares this photo on his blog of their stroll to a shopping center to hang out at a cafe. Zaccheroni commented during the pre-match press conference that he did notice some nerves among the squad members that day. When asked to expand, he said that though the players usually chat and play around with each other after their meals, he noticed the players were quieter that day and everyone headed straight for their rooms after eating. This must have made an impression on the Italian, who had been quite strict throughout the week with regard to the importance of switching mental gear to "fighting mode". To allay some of those nerves, the final day training was kept less-intense and light in mood. Zaccheroni's request for a practice game in preparation for the start of the WCQualifying round was answered with a last-minute Friendly scheduled vs Azerbaijan on May 23. After sinking against North Korea and Uzbekistan in the previous Qualifying round, Zaccheroni has been particularly concerned with the condition of the Europe-based players -- who make up 90% of his starting squad and more than 50% of his roster. The occasion marked the return of Keisuke Honda to the full squad after 8 months absence in and out of injury. Three players also debuted in this game -- 25-yr old FC Tokyo midfielder, Hideto Takahashi; the 22-year old sideback now top-listed by clubs around the world, Hiroyuki Sakai; and the 19 year old Arsene Wenger discovery and already-superadored Ryo Miyaichi. So, what have the squad been doing since? Domestic players were returned to their respective clubs for league duties, and the 12 Europe-based players remained with Zaccheroni after a day off to work on their conditioning. Yesterday, the 3rd day of camp, the European players had a practice match against Urawa club youth teams. With Yoshida delayed with Venlo duties, Hasebe and Hosogai filled in as a centerback with Honda in defensive midfield. Though no one believes this in any way reflects what Zac has in store for Oman, it still would have been fun to see. Domestic players also returned to Zac yesterday, spending the day on light exercise and avoiding any full-on practice. Remember, you can also see raw footage of National Team camp training at >>Samurai Blue TV (the official JFA portal for great photos and videos of training, interviews). They've updated with footage from yesterday's session -- you can see Zaccheroni playfully shoving Kagawa off the ball, and the other players as they go through their exercises. Click on the thumbnails listed along with dates to launch video. 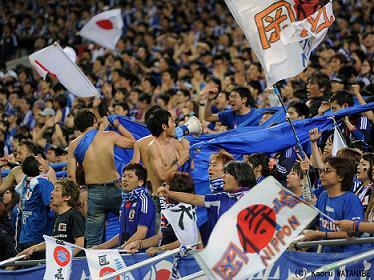 Since arriving in Japan, Alberto Zaccheroni has continued to show a great sensitivity towards the country and supporters. His style has particularly suited Japanese culture, and his affinity for Japanese food and his interest in facets of the country outside of football has won him a lot of appreciation. One thing this Japan National Team coach has done that others have not is to publish "letters" regularly throughout the year. These are presented as the "Il Mio Giappone" series, and it gives Zaccheroni a way to communicate directly with interested supporters. In them, he introduces a wide variety of topics, from how Italians spend their summers to how he appreciates the way Japanese people give him his privacy when he rides the subway, to his thoughts when visiting his players at their respective clubs around Europe, to what he witnessed while viewing J-league games. It is insightful and very interesting. Sooooo.....Here are the New Home and Away kits for the Japan National Team. I'm still not quite convinced that these two were great design choices graphically speaking -- though you can tell the creators bent over backwards to execute the difficult task of minimalist design to represent some great meaning. Gut-reactions from supporters have not been on the positive side -- overall effect of the line is weak, opponents can read player weight distribution if you put a line down the middle, why is the blue getting so dark, people have to squint and cross their eyes to see the washed out bird shadow, and so on. This, of course, has not stopped the home kits from selling out, however. A new kit is a new kit afterall. And despite the mixed response, the intention of bringing Japan together in Unity following the earthquake and tsunami disaster has been one undeniably significant facet of football in Japan during the 10 months since. Oh, what a truly disappointing end of the story. I don't think it has really hit me yet, the reality that it is all over. I've been also disappointed by the fact that I have been too busy to relax and really enjoy the World Cup. The way the schedule and time difference work out, most of the games are so late at night, and even those games I've taped I will have to wait a while to watch. I know I have been horrible about updating this blog, but maybe it was for the best... you all would be reading a lot of very frustrated entries! As for our boys in blue -- well, their performance in this World Cup begs several questions. - coach. What kind of coach does Japan need? - youth. With many of the players now in their late twenties and early thirties, it will be necessary to replace with a younger and inexperienced generation very quickly. - style. Does the Brazilian style of football fit Japan's abilities? - strategy. Was it too early to put together such a defense-light team? - physical. Both in terms of strength but also in terms of stature -- our defenders were completely dwarfed by the opponents. - conditioning. This team was out of top form going into the tournament -- too many injuries to too many players. - mental. This was a relatively cool team, lacking in some of the emotional gusto of previous generations. What kind of personality do we want out there on the pitch? - captain. I will be the first to admit, Miyamoto absolutely croaked out there. He is one to be extremely sensitive to details, and tends to get obsessed with the details. He fell apart this month -- something we caught a glimpse of during the first game against North Korea last year. On the other hand, someone like Hide Nakata, who often took the captain's armband in prior years, also had trouble bringing the team together, though he tried many tactics somewhere in there he lacked the natural power to bring the team closer together. For now, I will leave these issues for you all to debate at will. Now, it's back to the drawing board for the JFA. They announced a couple months ago that they would not begin serious consideration for the next National Team coach until July. Some people like the idea of going back to a Japanese coach for reasons of communication and commitment to Japanese football. Some people want to see another European style coach in the driver's seat. Some people don't care where the coach comes from just as long as he has a clear analytical and strategic mind, something more concrete than what Zico's philosophy offered. The JFA had said last month or so that they intend to stick with a Zico-type philosophy for the future of the national team -- in other words, they want someone who will allow the players a degree of independence and creativity on the pitch as well as bringing to the team the intangible qualities of a classy attitude as athletes. I really enjoyed reading everyone's comments on this blog -- it felt good to finally hear some of your opinions and hear how others felt. Thank you all so much for visiting and debating and exchanging information!! I will continue to look back at this team as the months pass, and perhaps come to some conclusion about what we can take from this experience. I have to admit, it was a bumpy and strange ride, but aren't they all...! An absolutely unforgivable turn of events. Kawaguchi saved us by barely a thread on numerous occasions. The team was not playing nearly good enough. The press was not working. The team did not take the shots properly or failed to attempt shots at all. The sides barely sent in any good crosses. The team still has problems keeping the lead when they score fairly early in the game. It has occured often, they give up the lead towards the end. Sometimes they fight back at the last moment, but all in all, it feels like they are still shaky when they have the lead. Tsuboi's early exit from the game (injury) was an unexpected disadvantage. It must feel surreal for Moniwa, who only a week or so ago was basking under the sun in Hawaii thinking his chance to be part of a WC squad had slipped through his fingers. Zico's lack of logic in substitutions reared its ugly head. In past games, the team was able to eke out wins despite the fact that Zico's player substitutions were very late or made for or with (what I believe) were inappropriate players. I love this team, and I do believe in Zico's basic philosophy that Japan can only get better if they are given the opportunity to grow into a bigger pair of football boots. However, the players were obviously exhausted in the last thirty minutes in the surprisingly high temperatures. And aside from the substitution made when Tsuboi was injured (I think he pulled his thigh muscle), Zico refused to budge. When he did make a move, way too late, it was to insert Ono for Yanagisawa. No offense to Ono fans (because I love the guy), but he ain't the player to put in at a time like that. Not only is he hardly dynamic on defense, but he isn't particularly fast or strong. Inamoto should have gone it at the very least -- Ina being one of those scrappy players who times tackles and slides really well. With only one forward left, it set the offense/defense balance off. And given the danger that Australia presented for most of the match, it was the wrong message to send. When Zico did decide to put in a forward, it was Oguro with only 3 minutes remaining. Sure, Oguro has played the last-minute savior in a number of memorable matches, the odds that he could pull off another in this game with the team playing rather poorly -- well, that was unfair to expect of Oguro. The team did not play well. But my irritation tonight is at Zico. He has always made it clear that his care for the players is utmost -- but there are times like tonight, when Nakamura was making mistakes (he passed to the Australian forwards near our penalty area), looked too tired to contribute to defense, and lacked quality on the few cross opportunities he got towards the end. It's true, Nakamura has the kind of one-chance magic that one would always like to keep on the pitch, but in general he should have been rested and would have not contributed to keeping the 1-0 lead towards the end. I'm not sure I make any sense, but I have to go to sleep (early day tomorrow), so I will end here. I'd love to hear what you all thought about the game. This puts Japan in an impossibly difficult situation going into the next two games -- Croatia are only going to be taller and even more rough on plays; and Brazil...well, is Brazil. I'll post any follow up news between now and the Croatia game. I just hope I can pull myself out of bed tomorrow -- the depression is probably going to make me want to call in sick at work!